Magnetite is a mineral and one of the three common naturally-occurring oxides of iron. Its chemical formula is Fe3O4, and it is a member of the spinel group. Magnetite is the most magnetic of all the naturally-occurring minerals on Earth. Naturally-magnetized pieces of magnetite, called lodestone, will attract small pieces of iron, which is how ancient peoples first discovered the property of magnetism. 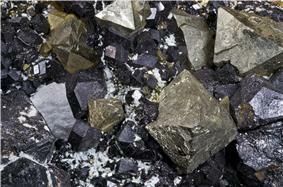 Small grains of magnetite occur in almost all igneous and metamorphic rocks. Magnetite is black or brownish-black with a metallic luster, has a Mohs hardness of 5–6 and leaves a black streak. The chemical IUPAC name is iron(II,III) oxide and the common chemical name is ferrous-ferric oxide. Lodestones were used as an early form of magnetic compass. Magnetite typically carries the dominant magnetic signature in rocks, and so it has been a critical tool in paleomagnetism, a science important in understanding plate tectonics and as historic data for magnetohydrodynamics and other scientific fields. 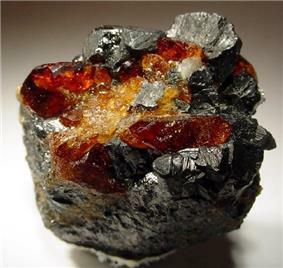 The relationships between magnetite and other iron-rich oxide minerals such as ilmenite, hematite, and ulvospinel have been much studied; the reactions between these minerals and oxygen influence how and when magnetite preserves a record of the Earth's magnetic field. Magnetite has been very important in understanding the conditions under which rocks form. 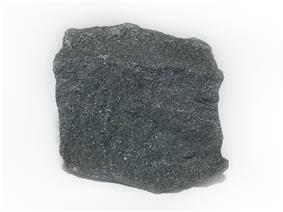 Magnetite reacts with oxygen to produce hematite, and the mineral pair forms a buffer that can control oxygen fugacity. Commonly, igneous rocks contain grains of two solid solutions, one of magnetite and ulvospinel and the other of ilmenite and hematite. Compositions of the mineral pairs are used to calculate how oxidizing was the magma (i.e., the oxygen fugacity of the magma): a range of oxidizing conditions are found in magmas and the oxidation state helps to determine how the magmas might evolve by fractional crystallization. 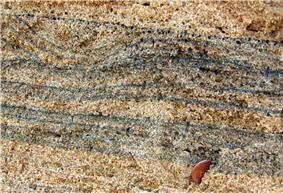 Magnetite also occurs in many sedimentary rocks, including banded iron formations. In many igneous rocks, magnetite-rich and ilmenite-rich grains occur that precipitated together in magma. 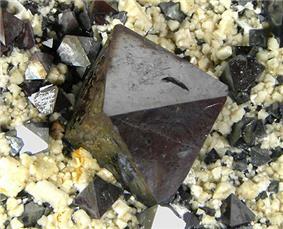 Magnetite also is produced from peridotites and dunites by serpentinization. The Curie temperature of magnetite is 858 K (585 °C; 1,085 °F). Magnetite is sometimes found in large quantities in beach sand. Such black sands (mineral sands or iron sands) are found in various places, such as California and the west coast of the North Island of New Zealand. The magnetite is carried to the beach via rivers from erosion and is concentrated via wave action and currents. Huge deposits have been found in banded iron formations. These sedimentary rocks have been used to infer changes in the oxygen content of the atmosphere of the Earth. Large deposits of magnetite are also found in the Atacama region of Chile, Valentines region of Uruguay, Kiruna, Sweden, the Pilbara, Midwest and Northern Goldfields regions in Western Australia, New South Wales in the Tallawang Region, and in the Adirondack region of New York in the United States. Kediet ej Jill, the highest mountain of Mauritania, is made entirely of the mineral. Deposits are also found in Norway, Germany, Italy, Switzerland, South Africa, India, Indonesia, Mexico, and in Oregon, New Jersey, Pennsylvania, North Carolina, West Virginia, Virginia, New Mexico, Utah, and Colorado in the United States. In 2005, an exploration company, Cardero Resources, discovered a vast deposit of magnetite-bearing sand dunes in Peru. The dune field covers 250 square kilometers (100 sq mi), with the highest dune at over 2,000 meters (6,560 ft) above the desert floor. The sand contains 10% magnetite. bacteria (e.g., Magnetospirillum magnetotacticum) to animals, where these crystals are found in the brain, including those of humans. Biomagnetites account for the effects of weak magnetic fields on biological systems. It has been proposed the magnetite in the brain contributes to long-term memory. Pure magnetite particles are biomineralized in magnetosomes, which are produced by several species of magnetotactic bacteria. Magnetosomes consist of long chains of oriented magnetite particle that are used by bacteria for navigation. After death of these bacteria, the magnetite particles in magnetosomes may be preserved in sediments as magnetofossils. Magnetite crystals are involved in magnetoreception in several species, the ability to sense the polarity, field lines  or the inclination  of the Earth's magnetic field, as an aid in navigation, and there is some evidence that it also exists in humans. Chitons have teeth made of magnetite on their denticles. Audio recording using magnetic acetate tape was developed in the 1930s. The German magnetophon utilized magnetite powder as the recording medium. Following World War II the 3M company continued work on the German design. In 1946 the 3M researchers found they could improve the magnetite based tape, which utilized powders of cubic crystals, by replacing the magnetite with needle shaped particles of gamma ferric oxide (γ-Fe2O3). Magnetite is the catalyst for the industrial synthesis of ammonia. Magnetite powder efficiently removes arsenic(III) and arsenic(V) from water, the efficiency of which increases ~200 times when the magnetite particle size decreases from 300 to 12 nm. Arsenic-contaminated drinking water is a major problem around the world, which can be solved using magnetite as a sorbent. Because of its stability at high temperatures, it is used for coating industrial watertube steam boilers. The magnetite layer is formed after a chemical treatment (e.g. by using hydrazine). Iron-metabolizing bacteria can trigger redox reactions in microscopic magnetite particles. 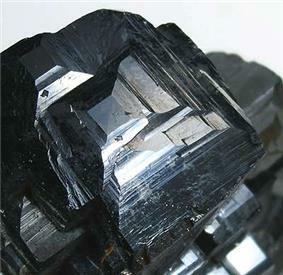 Using light, magnetite can reduce chromium (VI) (its toxic form), converting it to less toxic chromium (III), which can then be incorporated into a harmless magnetite crystal. Phototrophic Rhodopseudomonas palustris oxidized the magnetite, while Geobacter sulfurreducens reduced it, readying it for another cycle. ^ Hurlbut, Cornelius S.; Klein, Cornelis (1985). Manual of Mineralogy (20th ed.). Wiley. ^ Harrison, R. J.; Dunin-Borkowski, RE; Putnis, A (2002). "Direct imaging of nanoscale magnetic interactions in minerals" (free-download pdf). Proceedings of the National Academy of Sciences 99 (26): 16556–16561. ^ Templeton, Fleur. "1. Iron – an abundant resource - Iron and steel". Te Ara Encyclopedia of New Zealand. Retrieved 4 January 2013. ^ Kirschvink, J L; Walker, M M; Diebel, C E (2001). "Magnetite-based magnetoreception.". Current opinion in neurobiology 11 (4): 462–7. ^ Kirschvink, Joseph; (et al.) (1992). "Magnetite biomineralization in the human brain.". Proceedings of the National Academy of Sciences of the USA 89 (16): 7683–7687. Lay summary – Using an ultrasensitive superconducting magnetometer in a clean-lab environment, we have detected the presence of ferromagnetic material in a variety of tissues from the human brain. ^ Kirschvink, J L; Kobayashi-Kirschvink, A; Diaz-Ricci, J C; Kirschvink, S J (1992). "Magnetite in human tissues: a mechanism for the biological effects of weak ELF magnetic fields.". Bioelectromagnetics. Suppl 1: 101–13. ^ Banaclocha, Marcos Arturo Martínez; Bókkon, István; Banaclocha, Helios Martínez (2010). "Long-term memory in brain magnetite.". Medical hypotheses 74 (2): 254–7. ^ Kishkinev, D A; Chernetsov, N S (2014). "[Magnetoreception systems in birds: a review of current research].". Zhurnal obshcheĭ biologii 75 (2): 104–23. Lay summary. There are good reasons to believe that this visual magnetoreceptor processes compass magnetic information which is necessary for migratory orientation. ^ Wiltschko, Roswitha; Wiltschko, Wolfgang (2014). "Sensing magnetic directions in birds: radical pair processes involving cryptochrome.". Biosensors 4 (3): 221–42. ^ Wiltschko, Roswitha; Stapput, Katrin; Thalau, Peter; Wiltschko, Wolfgang (2010). "Directional orientation of birds by the magnetic field under different light conditions.". Journal of the Royal Society, Interface / the Royal Society 7 (Suppl 2): S163—77. ^ Baker, R R (1988). "Human magnetoreception for navigation". Progress in clinical and biological research 257: 63–80. ^ Lowenstam, H A (1967). "Lepidocrocite, an apatite mineral, and magnetic in teeth of chitons (Polyplacophora).". Science 156 (3780): 1373–1375. ^ Mayo, J.T. ; et al. (2007). "The effect of nanocrystalline magnetite size on arsenic removal". Sci. Technol. Adv. Mater. 8: 71–75. ^ "'"How bacteria can use magnetic particles to create a 'natural battery. KurzweilAI. March 30, 2015. Retrieved April 2015. Lowenstam, Heinz A.; Weiner, Stephen (1989). On Biomineralization. USA: Oxford University Press. Chang, Shih-Bin Robin; Kirschvink, Joseph Lynn (1989). "Magnetofossils, the Magnetization of Sediments, and the Evolution of Magnetite Biomineralization" (PDF). Annual Review of Earth and Planetary Sciences 17: 169–195.